Mobility has nowadays become the synonym of growth while the businesses which have no plan to build mobile apps have got very less chance to continue to grow in future. A dedicated mobile application is easier to use and navigate and looks much better than a mobile website. This is the digital age when mobility has a major role to play. The mobile apps have dominated the mobile market completely. Whether it is a small or big business, everyone is getting their dedicated mobile app to attract more customers through mobile devices as current digital environment is very much app focused. About 90% of mobile time is spent using mobile apps. Right now there are about 3.2 million apps on the Google Play Store and 2.2 million apps are on the Apple App Store but still there are so many new ideas if mobile apps are built around them then they will be sure shot success. In 2020, mobile apps are projected to generate US $ 188.9 billion in revenues via app stores and in-app advertising. 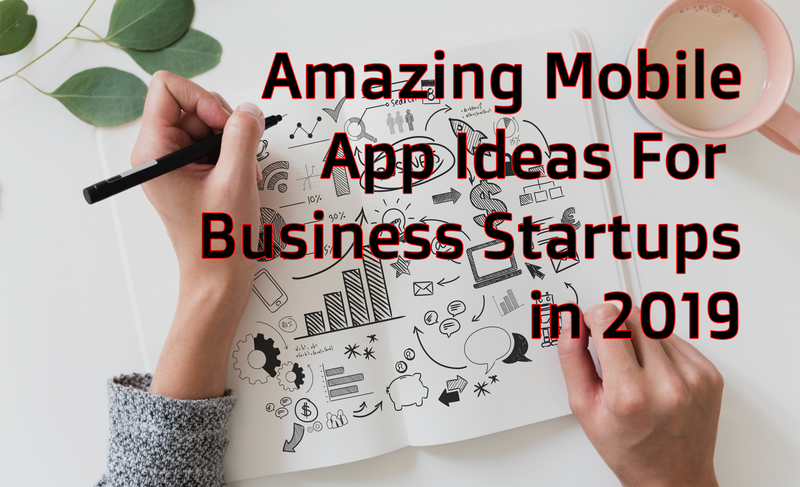 In this article, we will share the best app ideas for 2019 which you can use to develop your mobile app. Actually an App Development process or an app startup is mostly about a great idea. What the app can offer and is the app really needed in the market and can it become popular are some of the question that comes to every entrepreneur’s mind. But coming up with one of the best app ideas is not an easy task. It is one of the most critical part of the process that you have to think about. If you are looking for some really cool and new mobile app development ideas, then read on as we are going to share them with you here. Exchanging goods mobile app allows users to exchange various goods. A user will search for offers of those who want to exchange different items like bike, clothes, toys, electronic devices, mobile phones etc. Just imagine you have an extra mobile phone. It was a time when you used it a lot. Now it is useless for you while you are looking for some other electronic gadget which is available nearby with me. With the help of an app, I can get that mobile phone and you can get that electronic item. It is the best way to get stuff without money involved. This is one of the best mobile app idea from a list of App Ideas that may help you grow a business. You can start with your local area and then expand it into other regions and countries. This idea has a great potential to become internationally successful mobile app. So many people can remember and relate to the time when they have to sit for long hours to calculate and cut short their tax payments. One of the best app ideas for expense management can be Tax App. This app will calculate, how much tax the user needs to pay according to his income and ensure that the correct amount of tax is always paid. Additionally, if the app can generate invoices too, then your business financial work will become even more easier. Using this app, the users can calculate their taxes as well as generate invoices for all of their business transactions. There is a high chance of success for such an app in the app market. So many businesses Hire iPhone App Developer as they think that iPhone apps are more secure. But what if your iPhone or Android phone itself become more secure? Most of the people use passwords or pattern locks to secure their smartphones so that no one can use their phone without their permission or when they are not around. Hence there is a need for such an app that takes pictures whenever someone types the wrong unlock code on your phone and sends the photo of the breaker to your email. You can build a small business based on this idea as lots of people have become very serious about the security of their smartphones. So many people go to their doctor for regular health check-up and when they are sick. For regular check-up people have to remember that and make appointments for themselves with the doctor every time they go for it. Health inspector can be one of the best health app that will save the doctor’s number and according to the set duration, it will automatically text message for the appointment and will notify the user whether it was approved or not. Hence you can get the doctor’s appointment with ease using this mobile app. There is a need for an app in the market which can enable connection of multiple smartphones to play an audio or video file on each of the smartphones simultaneously. This app can be operated from one of the connected devices. You can just think when you are sitting in a room with your family or friends and a piece of music plays on each phone in the room, it will create enormous surround sound. Or just think when you are at the lecture and the speaker asks you to review an educative video. You don’t need a projector now and you can just take your smartphone, open the app and watch the video together with all the people present there in the room. This idea can be used for a startup. You can develop such an app and take a subscription fee for its usage. Everyone wants to get the chance to go for dinner at a great place or restaurant. Sometimes people have to make sudden plans to go there. If there is such a restaurant reservation app then they can use it to book their table in their selected restaurant before going there so that they would not be disappointed if they wouldn’t get vacant seat available when they arrive the restaurant directly. This app will offer a graphical layout of pubs and restaurants in the nearby area and the user will be able to book a specific table for a particular time in advance. The idea of this app is to create an interactive contact list that may contain recent Twitter or Facebook statuses, job titles from LinkedIn, contact information like phone number, email etc. from the internet, method to call the person via Telegram, Instagram etc. There is need for such an app because there are so many accounts and social networks which we use on a daily basis. We track photo of a person in one app say Instagram, communicate with him in another say Facebook, follow the activity in the third one say twitter. It will be much more convenient to open the contact list, find the person you are looking for and select what you need. This is a really amazing app idea and to build a startup company around it. Nowadays smartphones users have very good cameras in their phones and they take lots of photos of the same scene, person, place or an object. It has been noticed that it fills up lots of memory of our smartphones on daily basis. And it is not easy and fast to select the best pics on daily basis and delete others. That’s why there is a need for such an app called Photo Cleaner. This app will scan all the snapshots, identify and group similar photos not only duplicate ones and then propose and suggest the best ones to be saved and the others to be removed from the phone without making us worry that important photos are not deleted. Hence this is also a latest and promising app idea for a startup. There are many companies which offer trial/free products for the customers to collect the important reviews. It allows the companies to see how the users feel about the new products. It would be great if there is such an app containing free product samples available for orders. Also, the users would create their true profiles and leave honest and highly valuable feedback so that the companies can improve their products before a serious market launch. This kind of mobile app is perfect for companies producing food, cosmetics and other consumer goods. Collecting real feedback about new products, testing a few variants of one product with real customers or making some word of mouth marketing by using the app and giving free samples is really amazing and beneficial idea. This is an app that informs user when a new bill is generated and sent to him. After the user has signed in and selected the category he wants to track, he is notified whenever a new bill is generated and sent to him. The notification may contain the name of the bill and few words summary with an ability to review the full description of the bill. This application idea may interest companies providing legal, accounting, driving services. This app will benefit both the employees as well as the clients. We all are fond of movies, isn’t it? Well most of. This movies recognition app allows recognizing movies from some input. Let’s say, you see some trailer or part of the film and can’t remember its title. You can just take a snapshot of the scene, and the app will search for similar images on the internet. Or it may be that you may remember a quote but don’t remember what movie it is from. Using this app, you just have to type the phrase and the app will provide you the correct answer. Hence, this can be an idea for a startup or a new feature for any popular movie related mobile application. Many times it happens that you have a busy schedule and you don’t have the time to buy gifts for your near and dear ones on their special occasions. This can be one of the best app ideas for gift delivery. If the user needs to send someone flowers or gift but he doesn’t have enough time, then he will use this app and place an online order with the receiver’s address to get the flowers or the gift delivered without actually him visiting the physical gift shop. This app will also recommend gift ideas by fetching data from the social media. The businesses which are using mobile apps are booming like never before. This is the best time to build a mobile app as now billions of people around the world use smartphones and mobile apps on daily basis. But you need a promising and reliable app idea to build an app based on that. We have just discussed several such app ideas which have lots of potential to become successful in the market. You can choose any one of them and build an app around it and get set to run a successful business.